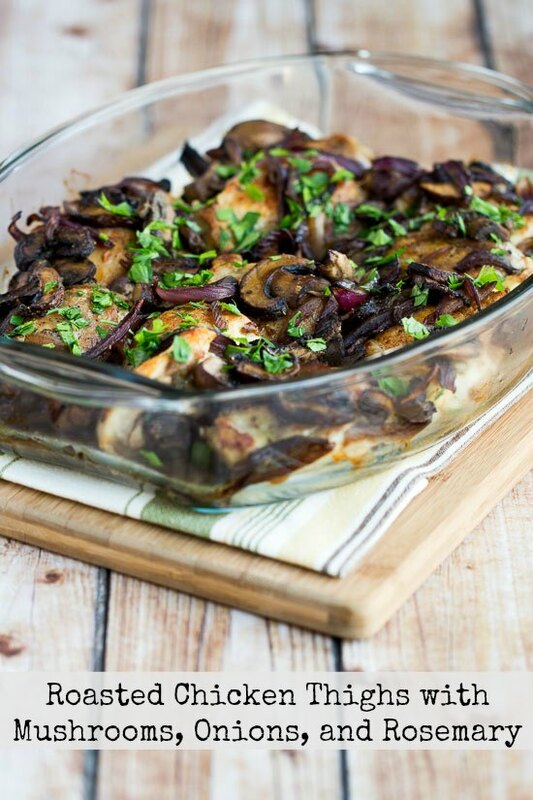 These Roasted Chicken Thighs with Mushrooms, Onions, and Rosemary are a tasty dinner option that’s low-carb, Keto, low-glycemic, gluten-free, dairy-free, Paleo, and Whole 30. And this chicken dish is delicious and easy to make. Use the Diet-Type Index to find more recipes like this one. 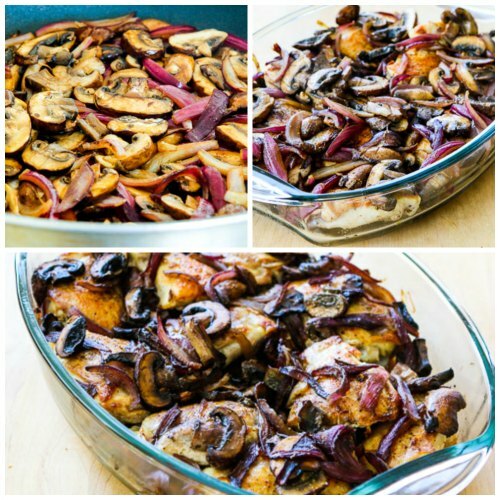 PIN Roasted Chicken Thighs with Mushrooms, Onions, and Rosemary! I don’t ever claim to be an expert about low-carb eating, but one thing I do know is that having a collection of really delicious low-carb dinners that are not to hard to make on a work night can really help. That’s why I’m always so happy when I make something that seems like it’s do-able for a week-night dinner, and I love all things roasted chicken. I’ve made roasted chicken sheet pan meals, whole roasted chicken, and chicken that’s stuffed and roasted, and these Roasted Chicken Thighs with Mushrooms, Onions, and Rosemary are another take on roasted chicken that’s so delicious you’ll probably make it over and over. The only hard thing about this recipe is trimming the chicken thighs, and if you use my trick of trimming with kitchen shears that makes it quicker and much easier! This recipe for Roasted Chicken Thighs with Mushrooms, Onions, and Rosemary produces moist and flavorful chicken thighs, with just a hint of rosemary and onion in the chicken. We used ground rosemary, but if you have fresh rosemary by all means use that. We also increased the amount of mushrooms, and you might increase the red onion too because those roasted red onions were delicious. Serve this with an easy stove-top side dish like The Best Easy Cauliflower Rice or bake something like Low-Carb Twice Baked Cauliflower alongside the roasted chicken thighs with mushrooms and you’ve got a great dinner! Trim the chicken thighs, removing the skin and trimming away most of the fat, or leave a little fat if you prefer. (I do that with kitchen shears, which is much easier than using a knife.) Grind up the rosemary in a mortar and pestle if you’re using dried rosemary. Heat the oil in a large frying pan and brown the chicken well, then place in a casserole dish. Saute the onions for a couple of minutes, then add the mushrooms and saute them about 5 minutes more. Mix in the ground rosemary or sprigs of fresh rosemary and layer the vegetables over the chicken. Roast at 350F/180C for 35-45 minutes, or until chicken is done and vegetables your house smells like rosemary! Serve hot, with fresh parsley sprinkled over if desired. This would taste great with Pureed Cauliflower with Garlic, Parmesan, and Goat Cheese. Preheat oven to 350F/180C. 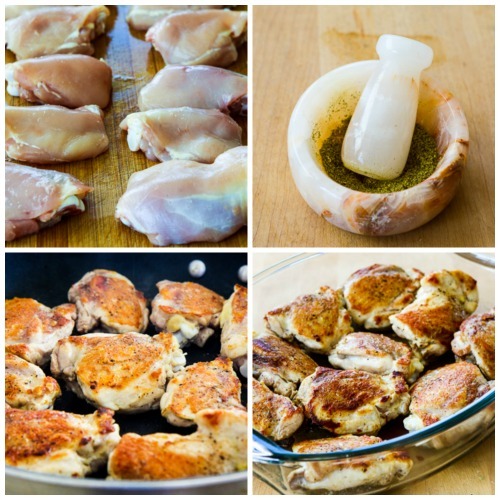 Trim chicken thighs, removing the skin and as much of the fat as you prefer, including the pocket of hidden fat on the back side of each thigh. (I do that with kitchen shears, which is much easier than using a knife.) Season thighs well on both sides with salt and pepper. Remove chicken from frying pan and place in glass casserole dish. Pour out most of the fat from the pan if it seems like a lot, then put onions in and cook 2 minutes. Add mushrooms and cook about 5 minutes more. Mix in ground rosemary or fresh sprigs of rosemary. Put partly-cooked mushrooms and onions over chicken pieces. Roast 35-45 minutes, until chicken and veggies are done and your house is smelling delightfully of rosemary. Serve hot, with any juice from the dish spooned over the chicken. This chicken was adapted from a recipe in Eat This Book by Tyler Florence. I got this book as a prize from a blog that no longer exists, and I miss Lisa who was the blogging friend who gave me the book! 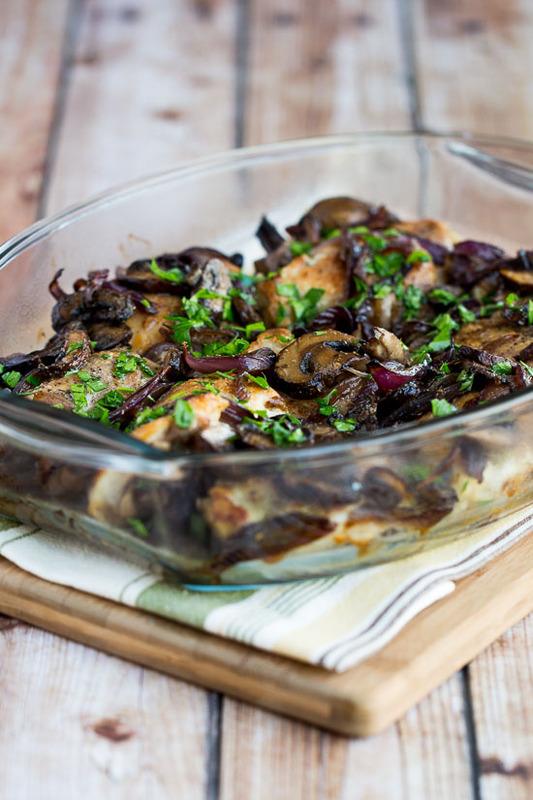 This recipe for Roasted Chicken Thighs with Mushrooms, Onions, and Rosemary is great for any Keto, low-carb, or low-glycemic eating plan, some of which might prefer to keep the chicken skin so you decide about that. Chicken thighs have always been a limited food for The South Beach Diet because of the saturated fat, but I trim the thighs well with my kitchen shears, and truthfully I’m not as worried about saturated fat any more; you decide whether you think this is okay for South Beach. does it really have 1090 calories ??? I entered in the information in a calorie counter and it comes out to about 450 calories per serving (I did it for 4 servings). Thanks Christine. I don’t count calories but this is probably helpful for those who do, and definitely Yummly is not always accurate. Fantastic recipe, so simple and quick to prepare. I’ve made it many times and it always comes out perfectly! Thanks, so glad you have enjoyed it! Great recipe! I made half thighs and half boneless skinless breasts. Both came out great and with the sauce spooned over the breasts were moist and delicious. Thanks for the kitchen shears trick. I never would have thought of it and it really makes a difference when the thighs are well trimmed. So glad you enjoyed it Julie. I'm getting really attached to those kitchen shears! Thanks Teresa; so glad you enjoyed it! Chicken thighs are so universal, everything goes with them Love it. Thanks Amy; so glad you like it! Chicken thighs are the juiciest & tastiest part of the chicken, so that…along with the other ingredients, will surely make an incredibly tasting dish! Thanks for posting it. You're welcome; glad you like it! Awesome recipe!! The ingredients are calling my name, definitely worths a try! Thanks Judy, hope you enjoy! I can imagine how wonderful the house smells when the rosemary is baking! Lydia, I do love that smell, and I really need to use it more since I have some growing in my window! I like the original picture better lol Looks more realistic to me. Definitely trying this recipe. My pleasure; hope you enjoy! So sorry, someone has already asked that! I must have overlooked that comment! What should I reduce the cooking time to? Thank you! I still agree with my comment above that if you want to use breasts, bone-in and skin-on will be better. I haven't made it that way so I can't give you an exact cooking time, but I would start checking after about 25 minutes or so. How do you think this would work with chicken breasts instead of thighs? If you use chicken breasts with the bone and some skin left on as the recipe calls for, I think it might work. You'd need to be careful not to overcook the chicken though or it will dry out. I don't think boneless or skinless chicken breasts will work for this at all. The recipe says "salt/pepper to season chicken" and "Season thighs well on both sides with salt and pepper." Not sure if squash will give as much flavor as the mushrooms, but I would definitely add some salt and pepper if you see this. hmm no salt or pepper? this is quite interesting. I followed the recipe exact, except I did not have any mushrooms. Instead I just tossed in what I had, squash. I'm fairly new to cooking food other than Indian dishes, so I'm not sure if it was the best idea to add the squash. Let's hope it turns out good. Cynthia, thanks for letting me know you liked it. I remember I was also amazed that such a simple recipe was so good. I know this is an old recipe but I just made it for Sabbath dinner because I had a whole box of Costco mushrooms and bag of Costco onions and it was a HUGE HIT. I highly recommend it. Wow, I’m behind on responding to comments. Tony – will do it this weekend. Erin – I am planning to try more. Sher – It was quite awesome if I do say so myself. Ruth – You could use breasts, which would be better, but I’d reduce the cooking time don’t you think? MM – I do agree that he seems a bit cocky. But the book is great. CC – I do miss her too. I’m glad we can keep in touch. Glenna – Thanks for the feedback. Good idea to try it with pork chops. Mona – Thanks. I was so happy to get the book. Kalyn, I can’t believe how simple that recipe is and how beautiful and tasty it looks in that picture. I’m so glad you a) won that contest and b) got a new cooking book. Congrats! I made this tonight for dinner for my husband and I, except I used pork chops instead of chicken thighs. It was fabulous. The smell literally made our mouths water. We were so hungry by the time we sat down to eat we gobbled it down. The only other things I changed were that I threw in a few quartered small red potatoes and I left the mushrooms whole. Thanks for the great recipe! I miss Lisa. How nice of you to connect us with her again, via your beautiful meal. I don’t what it is about Tyler Florence but something about him really irritates me. I can never watch a program with him in it without changing channel pronto. But I must admit he has some good recipes. That dish looks absolutely delish! That looks so awesome, I’ve bookmarked it for “special”, but I wonder why we couldn’t do it with chicken breasts instead. Would that make it more SBD friendly? Oh, you can tell that is a great dish!! I can practically taste it. I have to make that. Count me in …. I can’t wait to visit you & Vanessa in Utah! And that chicken looks good! I have made a few of Tyler Florence’s recipes, they always turn out really, really tasty.